the marriage between science and art can often times yield beautiful and inspiring results. 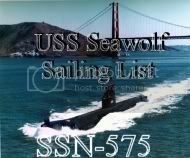 my shipmate Max sent me a link that i just have to share. LIFE magazine published an astonishing number of photographs over it's existence, and GOOGLE now has a dedicated search page to view LIFE photos. bias in the media....say it isn't so! Photios examines a whine newspaper article decrying the perception of media bias. check out his take on the screed. ok, so it's not really new news that i've enjoyed the hell out of Mr. Completely for a while. we've conversed over via blog posts and emails several times, so in the internet age, we're blog buddies. he's a gun slinging crazy man from Washington, and now he's my new food hero. if you have read my blog at all over the last couple of years, you'd know that there are two things i really enjoy. enjoy enough to share my experiences and views to any and all that will stop by and read. what are they? guns and food! i posted how to smoke salmon a couple of years ago. Mr. Completely posted his contest winning recipes for smoked salmon. you've got to check them out. me, i'm looking for a salmon or two to experiment with this coming weekend. thanks Mr.C. oh, and get better soon, ya hear? i have to agree with the sleepy eyed whiner of the deep. Camille Paglia is one of my favorite feminists too. i visit Salon.com every week just to keep up with her latest. i am way, way on the other side of the political spectrum, and i certainly don't think the new president-elect is all he's been touted to be. her latest article states ( a bunch of months too damned late, i'm afraid) that there are things we should have been asking of the candidate, now the next president. i thought i'd sit down this weekend and write about her views and statements, but Sleepy Eyed Whiner of the Deep not only beat me to it, but did such a splendid job that i'll just send those interested over to him. more evidence that THEY LIE! Pretty dramatic, i admit. but damn, the hype and hyperbole surrounding the world's global warming phenomenon has my head spinning. i've recounted in this blog several times that the data sets, and analysis of those sets, is not only flawed, but intentionally misleading. just a couple of links from here using the nifty blogger search bar --- bothenook's take on global warming---. ...GISS's computerised temperature maps seemed to show readings across a large part of Russia had been up to 10 degrees higher than normal. But when expert readers of the two leading warming-sceptic blogs, Watts Up With That and Climate Audit, began detailed analysis of the GISS data they made an astonishing discovery. The reason for the freak figures was that scores of temperature records from Russia and elsewhere were not based on October readings at all. Figures from the previous month had simply been carried over and repeated two months running. i don't know exactly why the pholks behind the whole global warming hysteria are doing what they are doing, but i can make a few educated guesses. i think the main reason is that the truth is not what is important, but the message. the message is that mankind is bad for the planet, and since we (those folks stirring the pot) can't kill everyone to save mother earth, we (again, you know, those folks) will concoct something really frightening, get a big time politician to pimp the idea, and force everyone into doing as we say, and thinking as we want them to think. UPDATE11/17/08. Gus has his own take on the article here. interesting stuff. i didn't want to sour my chances before, but now that the count is a 10 days, i think i can mention that i've given up smoking completely. i did it through the whole election debacle, and still maintained my "celibacy", so i'm thinking this is going to be a done deal. my goal is to get to the point where i can actually sit down and enjoy the occasional manly cigar and adult beverage without having to worry about my sliding back into the pack of cigars a day routine. a special thanks to Beeb for the tip on Swedish Snus. a very old friend of mine Skoal just wasn't making it. peppermint is one of my favorite flavors anyway, so this is my version of the patch. it's working, so what can i say. again, i find others that are more capable than i in expressing how i feel. an editorial in the WSJ by a lawyer that interned with Kerry's campaign legal team wrote a great opinion piece today. click here to read the article. i can't say it any better than commander salamander so head over and read his take on the election. regardless of all the rest of the junk that's happening in the world, one bummer of many is that Berkeley Breathed has retired Opus. for a detailed explanation of why he has pulled the plug on one of America's most beloved modern comic character, follow this link to an article exploring the end of Opus. i know, it's kind of sad to see a grown man bummed about the demise of a comic strip in this world of upheaval and turmoil. but then, that's probably why i'm so bummed out. 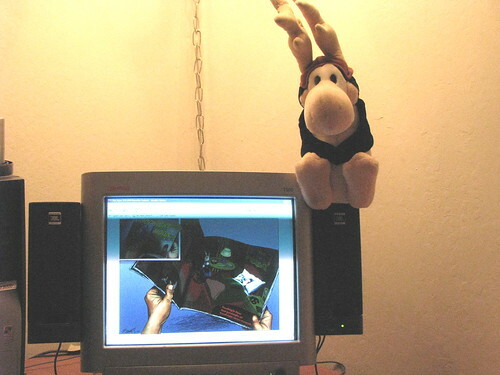 and Opus has been watching over me in the computer room for a long time. he was a Christmas gift from my ever so insightful daughter.